Moving on to Group C, with England hoping the Capello-Rooney and Lampard-Gerrard combination can finally carry them to glory, the United States hoping to have better one than in 2006, built on a strong qualification campaign and surprising Confederations Cup performance, Algeria who can dazzle or be self destructive and the Slovenian fighting unit, all hoping to finish behind England at second. Is it all on him? Not only, but Wayne Rooney is England’s main hope for the nation’s first World Cup trophy since 1966. His form this season for Manchester United maybe wasn’t enough for a title, but he certainly positioned himself as one of the best strikers in the world, if not THE best (We ranked him no.4 back in January). Steven Gerrard, despite having a dissapointing season for Liverpool is still one of the best midfielders in the world and Frank Lampard who scored 22 league goals this season for Chelsea show England do not lack firepower. We haven’t even began talking about Fabio Capello, maybe the biggest asset England has, at least for those who believe the head coach has a major influence on the game. So why not? Well, Rio Ferdinand’s injury means England’s shaky defense has one more question mark added to it. David James, who seems to be Capello’s first choice, has been playing pretty awfully this season. Joe Hart seems to be a much better fit, but his youth and lack of experience is keeping him away from the starting lineup. Again, having confidence in your keeper affect the back four’s play, and now that Terry will have a new partner, England’s defense doesn’t look as strong. The second question is who’ll play upfront with Rooney, as Crouch seems to be the preferred choice, not necessarily the best choice in my opinion. 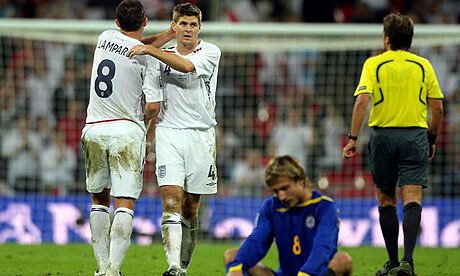 Due to the problematic pairing of Lampard and Gerrard in the middle, Capello usually uses Gerrard on the left. Maybe he should look at using him as a second striker, a position he enjoyed when paired with Torres at Liverpool. Bottom line – England needs James to be mistake free, or nearly free, Lampard to play like it’s Chelsea, Gerrard to forget about the 2009-2010 Liverpool season and Rooney to forget he was injured during the final weeks of the season. Too many if’s, but still, England have the potnetial to go very deep in this tournament. Maybe all the way. Just don’t let the match reach penalties. Another 2006 (failure to qualify from the group stage) or a dreamy 2002 repeat (quarter finals)? Bob Bradley has a group that certainly believes it’s possible. The group seems comfortable enough to finish second, but will the US, who certainly lack quality in the midfield and as the friendlies have shown lack discipline and concentration in the back, be able to to hold enough of the ball, especially in the matches against Algeria in Slovenia, in order to relieve pressure from their fragile defense. 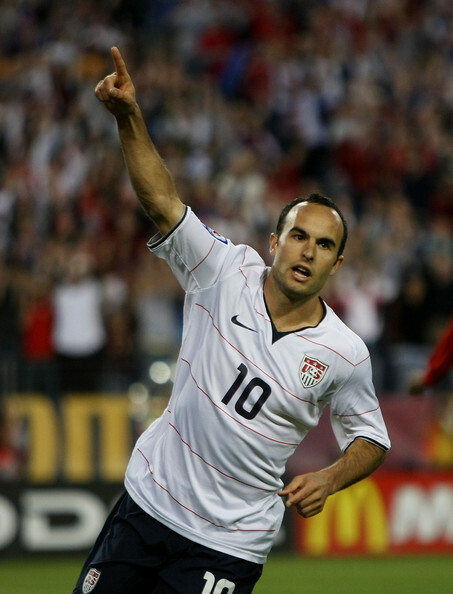 Landon Donovan is the man who’ll be leading this team and where he goes, the Americans will follow. He was a pleasant surprise in the 2002 World Cup, but rather disappointing in ’06. See a pattern? Another interesting question is how Dempsey will play. He is backed by two fantastic seasons with Fulham and Bradley is probably pondering whether to use him on the opposite flank to Donovan or partner him with Altidore up front. Edson Buddle’s form (2 goals against Australia this weekend) might be the answer to that question. The Americans don’t have a lot of talent but are “tough to beat”. They’ll need more than being tough to qualify from this group, but I think they have enough to make it into the group stage. Is Algeria the team that stunned Egypt in the deciding match of African qualifiers and beat the Ivory Coast during the Africa Cup of Nations, or the team the imploded against the Egyptians in the tournament and losing convincingly to Serbia and Ireland preparing for the World Cup, managing only a 1-0 win over the Emirates? They’re a talented bunch, especially in midfield, boasting a lot of skill and flair, but the team tends to break down quickly if facing an early deficit. When they lost to Egypt in the African tournament, things got ugly, due to all the bad blood between the teams. Algeria have a fantastic duo at full back (Belhadj and Halliche) and will probably use only one striker, Abdelkader Ghezzal of Siena, as most of their fire power comes the wings and technical midfielders (Ziani, Yebda). Again, there’s talent, but is there enough mental strength to surprise and make it through the group stage? I think not. No more Zahovic, no flair. This is a fighting, hard nosed and hard defending unit, with only The Netherlands allowing less goals during the European qualifiers. The team plays a 4-4-2 tactic (like against New Zealand on Friday, won 3-1) or a 4-3-3, but it doesn’t really matter, as the entire team defends and attack as one. Milivoje Novakovic (scored two free kicks against the All-Whites) is their main threat and is either joined by Birsa and Dedic when it’s 4-3-3 or by Ljubijankic when it’s 4-4-2. Slovenia depend a lot, as a team that tends to be more on the defensive during the match, on their fantastic keeper Handanovic who plays his club soccer for Udinese, where he has looked shakier than for the national team. Robert Koren, who had a big part in West Brom’s return to the Premiership this season is the main man in the middle of the park for the Slovenians, hoping to get their first World Cup point this time around, after losing all three matches in 2002. Chances? A point – yeah, but qualifying? I’m not too sure. Like Algeria, but more due to their lack of firepower, Slovenia don’t stand a chance if they fall behind first.